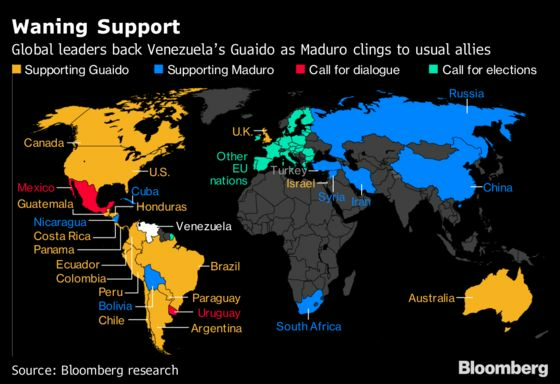 (Bloomberg) -- Venezuelan President Nicolas Maduro, hemmed in by ever-stronger U.S. sanctions, asset seizures abroad and calls for him to hand over power, is offering to sit down with the opposition to find a peaceful solution. However, his opponents, led by National Assembly President Juan Guaido, have seen this tactic before from Maduro and don’t seem ready to engage again. Maduro made his overture early Wednesday, telling Russia’s RIA Novosti news agency, “I’m willing to sit down for talks with the opposition so that we can talk for the sake of Venezuela’s peace and its future.” He mentioned the possibility that Mexico, Uruguay and the Vatican could act as intermediaries. In late 2016, Venezuelans took to the streets over a blocked recall referendum that might have cut Maduro’s term short. Maduro, feeling the heat, agreed to sit down with his opponents in talks mediated by the Vatican. The result? The streets went quiet, a few political prisoners were released and Maduro plowed forward with the creation of an alternate legislative body to rewrite the constitution, leaving the opposition bitterly divided. Former Spanish Prime Minister Jose Luis Rodriguez Zapatero, who participated in previous attempts at dialogue in the Dominican Republic, has been criticized by the opposition for helping the administration buy time. Later, the government said it was willing to talk about terms of the presidential election, even pushing the date back, only to ban most opposition parties and hold a vote that was largely seen as fraudulent by the international community. If the opposition is skeptical of Maduro’s latest offer, U.S. President Donald Trump, who is trying to force change in Venezuela via sanctions, said that it shows the pressure is working. Trump congratulated Guaido in a phone call on Wednesday for declaring himself interim president of the country, the White House said. Guaido himself has yet to reply to Maduro’s call for talks. 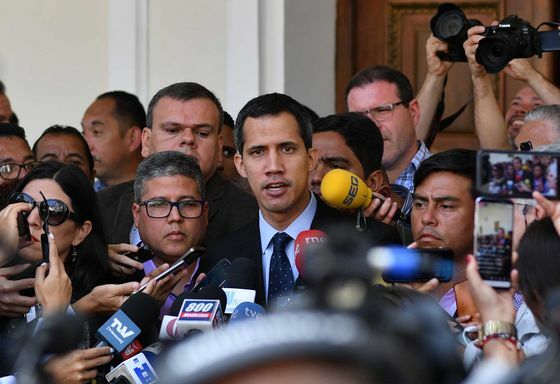 Today, Guaido has called on supporters to take to the streets, following last weekend’s efforts to publicize a measure that promises amnesty against corruption or abuse allegations to any soldier who defects. “The last week has been entirely focused on trying to signal the armed forces that they should break from Maduro and so far they haven’t done that in a meaningful way. The military continues to swear loyalty to Maduro," said Geoff Ramsey, an analyst at the Washington Office on Latin America, a research organization that works for human rights. “I’m not sure what else there is, beyond some kind of credible, negotiated solution." Maduro’s first sit-down with opponents took place in 2014 after anti-government unrest claimed dozens of lives. The dialogue, facilitated by regional leaders and the Vatican, was televised and lasted more than four hours, but the warring factions reached no accords.